The New York Times has abandoned all pretenses at objective journalism or even decency. 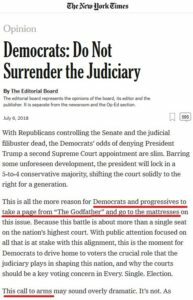 On July 6, 2018, the Times‘ editorial board published an editorial titled “Democrats: Do Not Surrender the Judiciary,” calling on Democrats and progressives to go to war against President Trump by deploying unscrupulous mafia tactics. The term “going to the mattresses” means going to war. The Urban Dictionary accurately describes the phrase as meaning “preparing for battle” within the context of a mob war, a violent mob war involving firearms, assassinations, and bombings. As of July 7, Breitbart News has documented 190 acts (this list continues to be updated and now numbers 254) of media-approved violence and harassment against Trump and his supporters during the last 31 months. The establishment media continue to ignore, downplay, encourage, and even justify violence against their political enemies on the right, and the result of this indifference and wink-wink encouragement is an epidemic of violence and harassment. Simply put, the media have declared “open season” on Trump supporters. 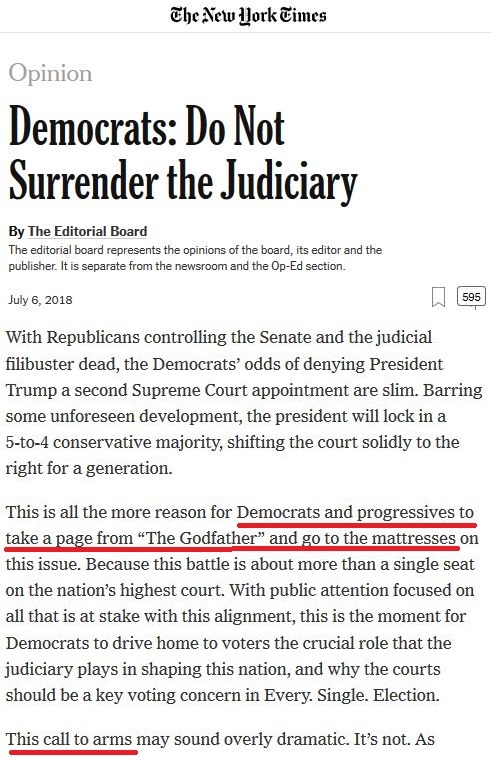 And now, we have the “esteemed” New York Times editorial board calling for Democrats to use the mafia as their inspiration to stop a judicial appointment. Keep in mind that the same media encouraging this violence against everyday Americans is the same media constantly campaigning to have those same everyday Americans left helpless by disarming them. As an African American man, I have lived in the DC for a considerable period of time, and I have never seen the type of vulgar, mean spiritedness rage after an election. After the election I went to my place of work, and the police told us to remain in the building because of the riots taking place. When President Obama was elected that never happened. Yes, conservatives hated it, vowed to make him a one term president, but no burning cars, broken windows, bullied people because you wore an Obama or hat shirt. 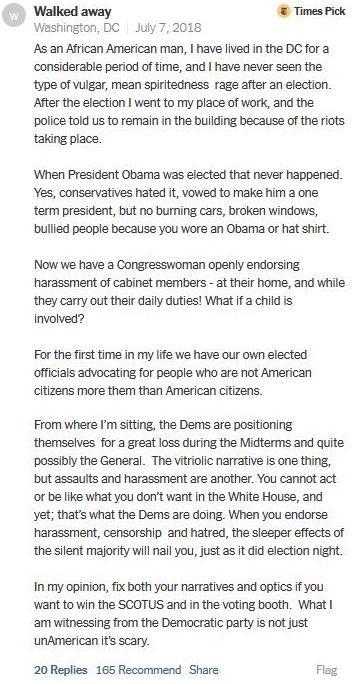 Now we have a Congresswoman openly endorsing harassment of cabinet members – at their home, and while they carry out their daily duties! What if a child is involved? For the first time in my life we have our own elected officials advocating for people who are not American citizens more them than American citizens. From where I’m sitting, the Dems are positioning themselves for a great loss during the Midterms and quite possibly the General. The vitriolic narrative is one thing, but assaults and harassment are another. You cannot act or be like what you don’t want in the White House, and yet; that’s what the Dems are doing. When you endorse harassment, censorship and hatred, the sleeper effects of the silent majority will nail you, just as it did election night. In my opinion, fix both your narratives and optics if you want to win the SCOTUS and in the voting booth. What I am witnessing from the Democratic party is not just unAmerican it’s scary. This entry was posted in Donald Trump, Liberals/Democrats/Left, MSM, Trump Derangement Syndrome, United States, US Presidents and tagged corrupt New York Times. Bookmark the permalink. This type behavior by the Democrats can only reinforce they are mentally deranged and should be instituted, put on a psychotic medication and remain there indefinitely under close supervision. They’ve lost all sense of reason, critical thinking and a degenerative brain condition. They’re a danger to themselves and and the public and shouldn’t be allowed outside the confines of an institution. Not only would the mentally handicapped, who’s brain damage only increases by spreading vicious lies, be separated from the civilized population but humanity in general would improve.